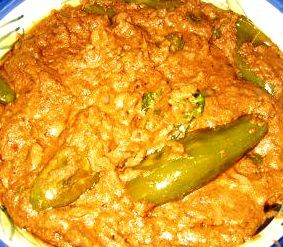 Mirchi ka Salan – my style! Roast the sesame seeds, cumin seeds, coriander seeds and peanuts. Keep aside to cool. Take 1 tbs oil in a pan. Fry the sliced onions until they turn transparent. (Do not let them turn brown). Keep aside to cool. Blend the fried onions, grated coconut, roasted peanuts, sesame seeds, cumin seeds and coriander seeds to a paste. Add some water (approx 1/4 cup) to make the blending easier. Heat 2 tbsp oil in a pan. Fry the chillies for approx 4-5 minutes on a medium flame. Keep the chillies aside. In the same pan heat the remaining oil. Fry the blended masala paste with ginger-garlic paste and tamarind paste for approximately 4-5 minutes. Add the yoghurt to this and mix. Make sure the yoghurt is completely incorporated into the paste. Add the fried chillies to this. Mix and add 1 cup of water. Boil for 5-6 minutes. Turn off the heat and keep the pan covered for 5 minutes. Serve with paratha or rice. I love the Bhavnagari chillies for their correct amount of ‘hotness’. 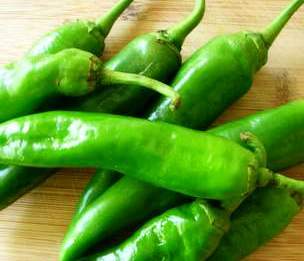 You can use any other variety of green chillies. You can also de-seed them to make the chillies milder. The real fun though is in the salan. It is tangy, hot and delicious. Replace the chillies with eggplant and you have Baingan ka salan! I am not sure about the authenticity of this recipe but I know that it is truly delicious. Try it! I made this at home but more in the Hyderabadi style. It was awesome! The most important ingredient of the Hyderabadi one is Fenugreek and Shahi jeera powder. Thanks for the recipe! PS: In Hyderabad, they also replace the Mirchi with Brinjal and full tomatos. Awesome recipe and it is authentic, let me assure you! Keep up the good work! Previous Previous post: Non-Spicy Cabbage Poriyal – Simple, light and vegetarian!